The Field and Hunter Boot challenge intrepid adventurers to bag a brace of grouse, a stag and a salmon all within a day, this autumn, for The Field and Hunter Balmoral Macnab Challenge. This is fieldcrafts’ Olympian challenge. 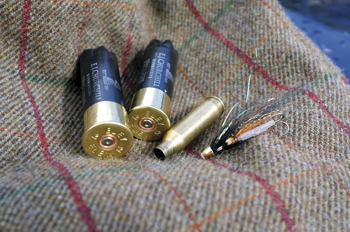 For those who find geography conspires against the classic macnab combination of grouse, stag and salmon, there are 10 other categories in The Field and Hunter Balmoral Macnab Challenge at which they can try their skill. Like the Classic Macnab, all must be completed in one day. Those who prove successful will be invited as guests of The Field to the Macnab Dinner 2012, to be held in Scott’s Private Room and featuring an exclusive Macnab menu created by the restaurant to celebrate great British food and sport. In celebration of The Field’s Macnab challenge, Scott’s Head Chef, Dave McCarthy has created a bespoke Macnab menu with the finest ingredients from the British Isles. This will be available for parties of 15 to 40 in the private room at Scott’s from 1 October until 10 December 2012. A Mayfair legend, Scott’s joined Caprice Holdings in 2005 when it reopened to great acclaim after a painstaking restoration by Martin Brudnizki. His contemporary interpretation gave this revered seafood restaurant a veneer of distilled glamour that extends to its intimate Art Deco private room. An extension of the restaurant, this is beautifully laid out and hung with works by leading British artists. From late September 2012, leading Mayfair galleries Timothy Taylor and Sadie Coles will be co-curating an exciting collection in the private room. Up to 40 guests can be accommodated for lunch or dinner, and 50 for a canapé reception. With wi-fi and two flat screens, the private room can house conferences and presentations as well as private celebrations and corporate dining events. Menus range from £49 to £90 per person for lunch and dinner. The Field Macnab menu is £75. For other Field Macnab challenges, rules and further information, visit The Field and Hunter Balmoral Macnab Challenge or contact Alexandra Henton | 020 314 84772.